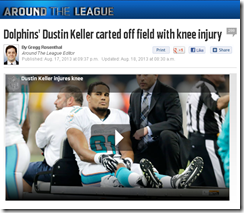 Dustin Keller Gruesome Knee Injury: Should Teams Make Knee Braces Mandatory In Preseason? Week 2 in preseason football is the third game for the Miami Dolphins. It is also the most heart breaking. Tight end acquisition Dustin Keller – the guy they had been banking on for third down conversions – had a “gruesome” knee injury during the second quarter at Reliant Stadium in Houston. When we say gruesome, imagine your right knee bending in a way that it should not be able to bend, that type of injury ends up making a lot of fans gag when they see it. Keller‘s leg bent unnaturally when he was tackled on the right knee by D.J. It was unclear when he was injured, but he was taken to the locker room to be evaluated in the second quarter and the team said he wouldn’t return. Watch this video at your own risk… at the 0:40 mark you will see the hit that made a lot of people feel ill! The Tampa Bay Buccaneers has made it mandatory for all of their quarterbacks to wear a knee brace in practice, should receivers and tight ends wear them in preseason games?